Headset-maker Plantronics on Tuesday debuted its first entry into the huddle room video market with its new plug-and-play video bar, Polycom Studio. Any company whose employees use PCs or Macs for video collaboration with services like Zoom, Microsoft Teams, Skype for Business, Google Meet, Cisco Webex or Amazon Chime can get Polycom’s HD audio and video quality packaged into a portable USB device, Plantronics said. Last summer, Plantronics completed its $2 billion acquisition of Polycom, creating a new company that offers a suite of products and services that span headsets, software, desk phones, audio and video conferencing, and analytics. 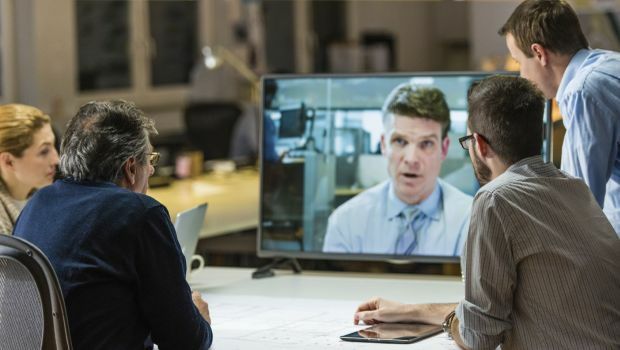 As for partners that traditionally have focused more on video conferencing, this is going to let them “get into the large number of huddle rooms that are being deployed,” said Brian Phillips, Plantronics’ senior manager of product marketing. Polycom Studio wirelessly connects to a corporate network allowing IT professionals to deploy and manage Polycom Studio units — across a few huddle rooms, a large campus or offices around the world. Customers can manage their Polycom Studios along with their other Polycom devices through the cloud with the Polycom Device Management Service for Enterprise or on premises with Polycom RealPresence Resource Manager. Last month, Tom Puorro, previously Cisco’s vice president of engineering, and vice president and general manager of its UC technology groups, joined Plantronics as its executive vice president and general manager of group systems. In this role, Puorro is leading the team responsible for audio and video collaboration solutions for the modern workplace. In addition, Plantronics announced a native Microsoft Teams video conference offering in collaboration with HP. The bundle is available in the United States through shared distributors of Polycom and HP products such as Synnex and Ingram Micro. Combined, the companies count more than 82 percent of Fortune 500 companies among their customer base. The UC company is taking its open video conferencing initiative to enterprises. Polycom says the new offerings are focused on advancing the workplace of the future within businesses across the globe.